We are currently performing a climate impacts assessment of the CCE to seehow projected changes in temperature and precipitation could affect the region’s ecosystem energy and water constraints and drive changes invegetation productivity in the 2020s (2010-2039), 2040s (2030 – 2069) and 2080s (2070 – 2099). 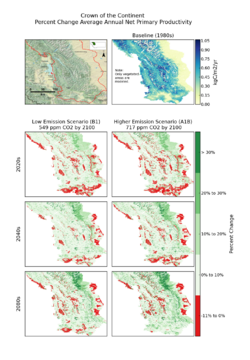 We have generated a fine resolution (~800m) spatialclimatology of the region and used it downscale GCM-derived Pacific Northwest climate projections (B1 and A1B scenarios) provided by the ClimateImpacts Group at the University of Washington (Mote and Salathé 2009). 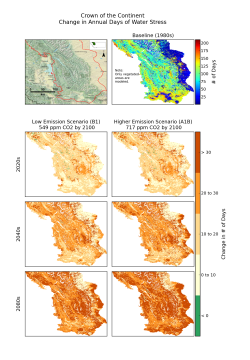 In this preliminary downscaling effort, we used the simple delta downscaling method along with a stochastic weather generator. 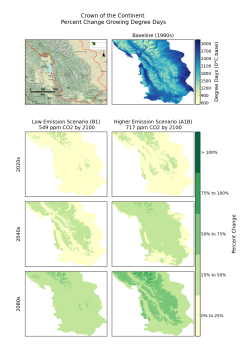 We forced the Biome-BGC ecosystem model with the downscaled climatology to model ecosystem changesfrom 1970 – 2001 for evergreen needleleaf forest, grass, deciduous broadleaf forest, and shrub functional types. Initial results show a dramatic release of energy constraints and thecrossing of critical temperature thresholds for much of the landscape along with overall decreased snow pack and increased water stress. 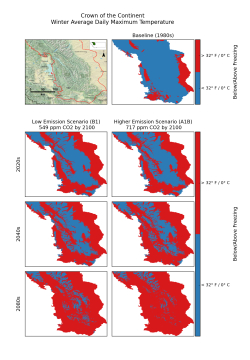 Althoughvegetation productivity appears to increase for much of the CCE, the release of temperature constraints appears limited in dramatically increasingproductivity due to the enhanced water stress. 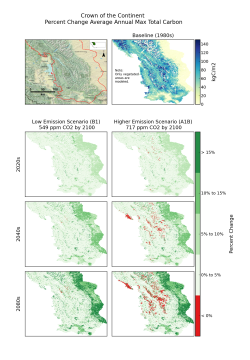 Since current precipitation projections are highly variable and the projections used in this initialstudy show little change in precipitation, future work will focus on better quantifying the thresholds that could tip the balance between the lessoning of energy constraints and the increasing of water constraints within the CCE.